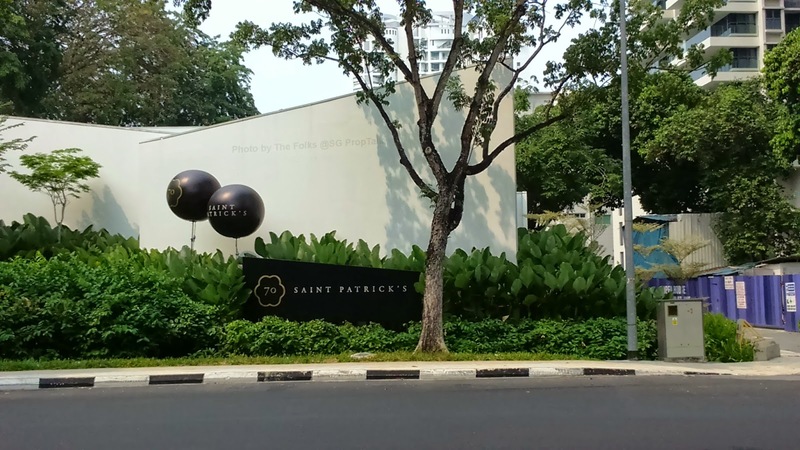 The wife and I decided to head to the east last week to look at 70 Saint Patrick's - a freehold development by UOL Group that had made news recently for being of one of the fastest selling project despite the current slow market sentiments. It was reported that the project sold more than 100 of its 186 units during the first weekend of private launch back in September, at an average price of $1,630psf. 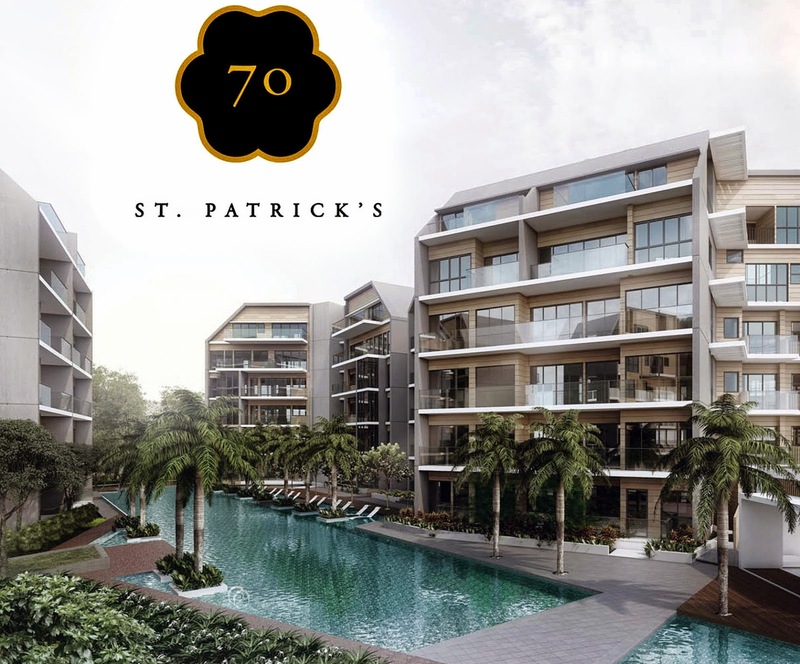 The location of 70 Saint Patrick's is along St. Patrick's Road (where the main entrance of the project will be located), which is a stretch of road sandwiched between East Coast Road and Marine Parade Road. The actual site is also sandwiched between two other completed residential developments - St. Patrick Residences and Grand Duchess at St. Patrick's. However, UOL has decided to put the showflat on an empty plot of land opposite the Amber Road roundabout, next door to Silver Sea. 70 Saint Patrick's is a low-rise development comprises of 9 blocks of 5 stories each. The 186-unit project resides on a plot of close to 140,000sqft and offers unit types ranging from 2-bedder to 4-bedroom dual key. There are also penthouses with 2- to 4-bedrooms. 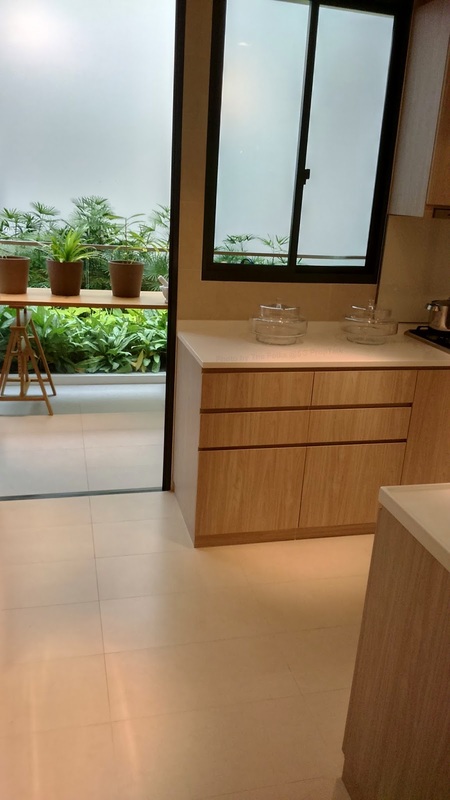 However, it is the only project amongst those that we had visited in recent months that does not offer 1-bedroom units, which is a refreshing change. Facilities wise, these are structured into five larger organizing thematic zones. At the centre of the development is the social and wellness zone where the clubhouse, gym, the 50m lap pool and hydro gym are located. 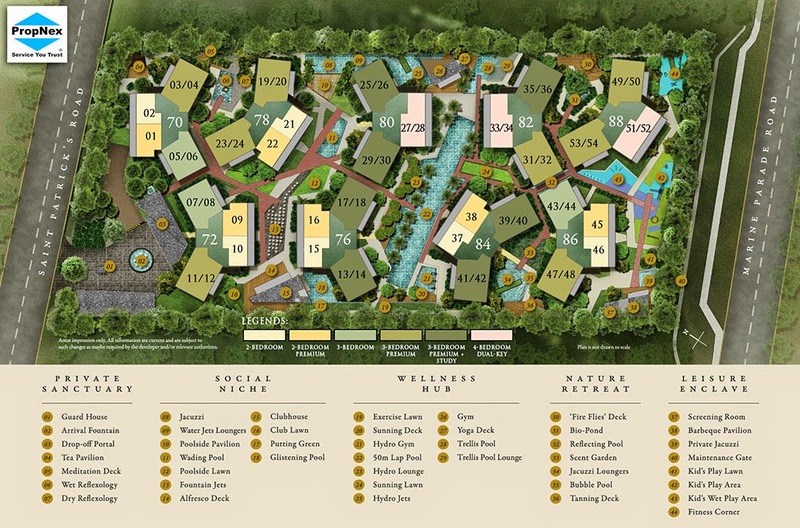 Around this central zone, the rest of the common zones, including a quiet private sanctuary, an exciting leisure enclave and the nature retreat are conceptualized as a series of experience offering their respective amenities. However, the one feature that caught our eyes is not any of the facilities on offer but rather the main frontage where the drop-off portal and arrival fountain are found. 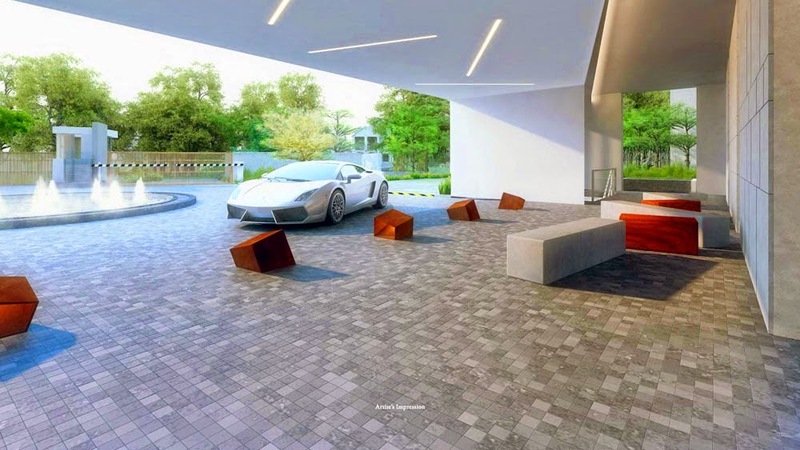 The grand entrance injects an additional sense of class to the whole development. For parking, there is a total of 186 parking lots plus 3 handicap-lots within the development - so your typical "one lot per apartment" that is pretty much the standard for new projects these days. The wife and I were told that since 70 Saint Patrick's is within walking distance to the future Marine Terrace MRT station, not every household will necessarily own a car. However, we always take such claim with a huge dose of salt... especially when the MRT station is supposedly coming online 6 years after the project's TOP. And speaking of TOP of 70 Saint Patrick's, this is estimated to be in December of 2017. There are 2 showflats on display in the sales gallery - a 2-bedder and a 3-bedder. 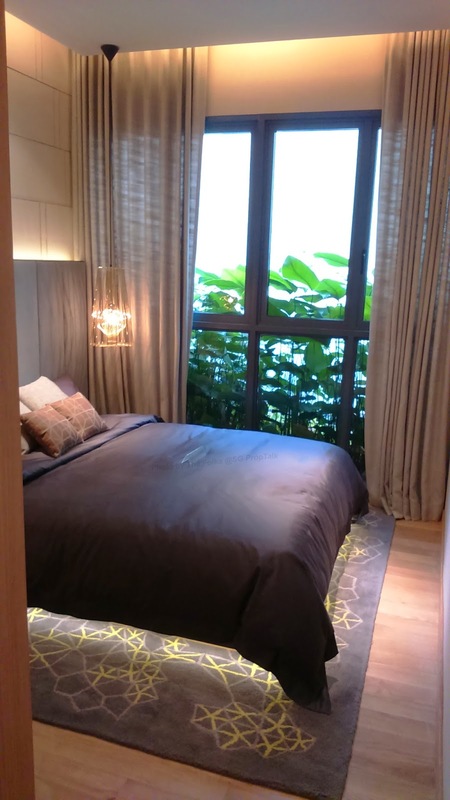 The showflat that we will focus on is a 3-bedroom + Study unit (Type B4) of 1,270sqft. As you enter the main door, you arrive into the living/dining area. This is a rectangular-shaped area that is a tad too small for our liking. The area comes with what looked to be good-quality marble flooring but the 2.95m ceiling height is a bit of a disappointment. One particular feature of this unit type is that it is not one but TWO balconies. The main balcony outside of the living/dining area actually extend across to one of the common bedroom and the study as well - these means all 3 areas have direct access into the balcony. The other balcony is located behind the kitchen, which is probably most useful for air-drying of laundry. And speaking of the kitchen, it is quite good-sized and comes with ample storage cabinets. 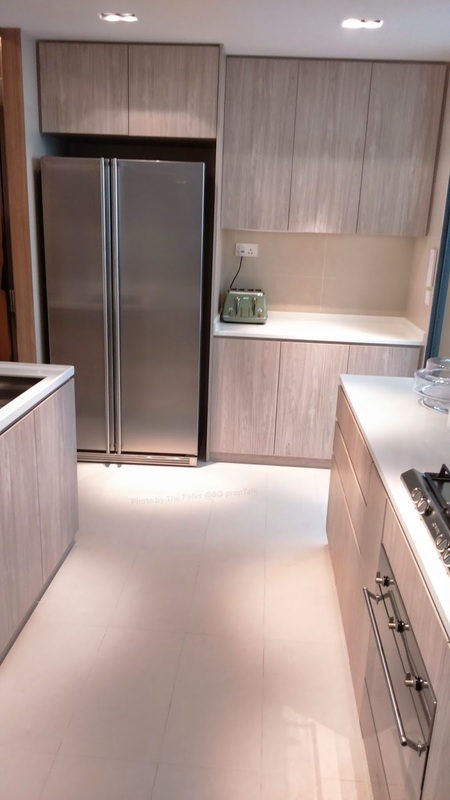 And for a change, you do not find Electrolux in this kitchen - the appliances are from Smeg and definitely better looking than those we had seen in other projects recently. The small yard area is located at the end of the kitchen - you are left with limited space after putting a washing machine here. 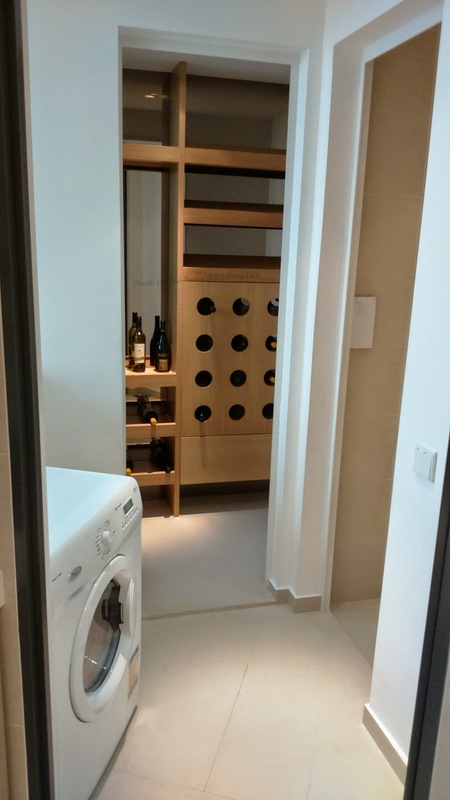 The utility is a narrow strip of space and probably more suited for storage (although probably not for wine in the manner displayed in the showflat, given our kind of weather) rather than housing human (aka your helper). The adjacent toilet is small but functional. 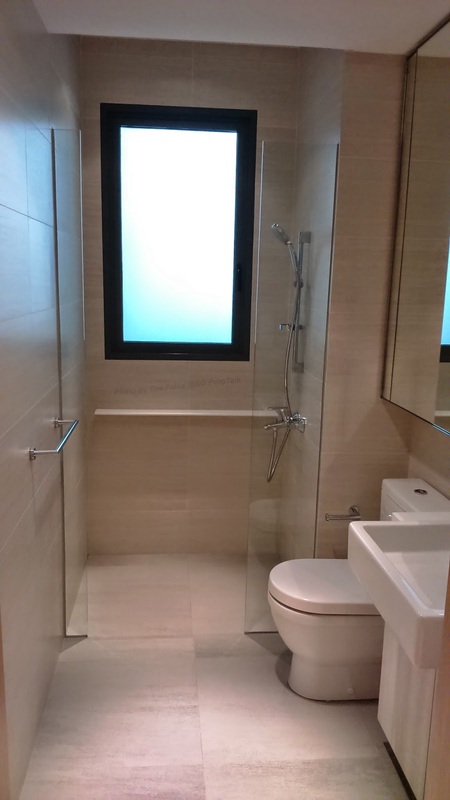 The common bathroom is furnished with good quality tiles for its floor and walls. 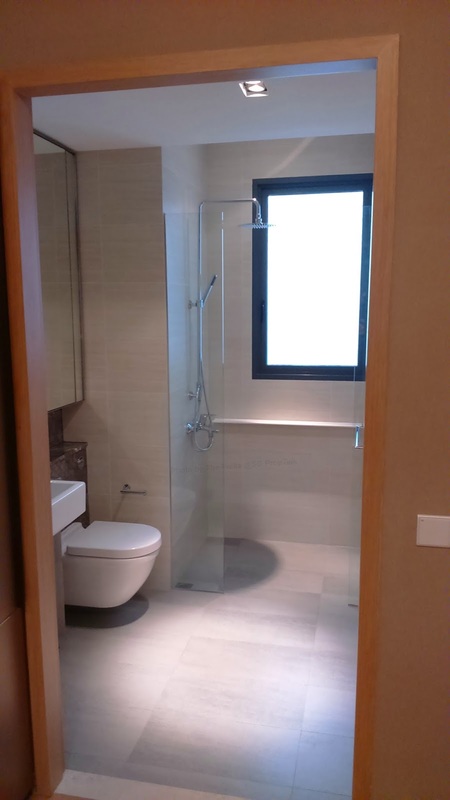 It also comes with fittings from Duravit and Hansgrohe. A large frosted window in the shower stall ensues proper ventilation in the bathroom. The two common bedrooms are amongst the largest that we have seen in a long while. The room does not feel cramped even with a Queen-bed installed within. Both rooms also come with "floor to ceiling" (okay, not quite to the ceiling) windows, which increases the amount of natural light the rooms get during the day. The master bedroom is humongous by present standards. You do not have to take our words for it - just take a look at the photos we took. The bed is standard King-size, mind you. 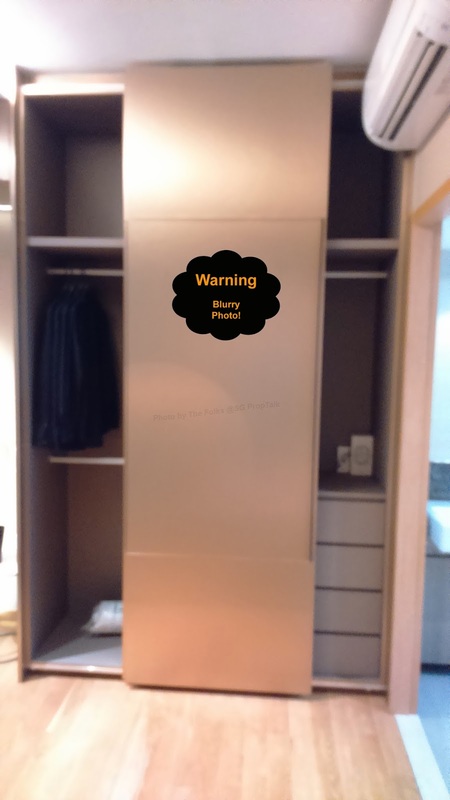 You also get a " floor to ceiling" (this time, it's the real mccoy) wardrobe, which means you have more space to store those "one in each color" sets of clothing that you enjoy buying. The master bathroom is almost a replica of the common bath... even down to its size. 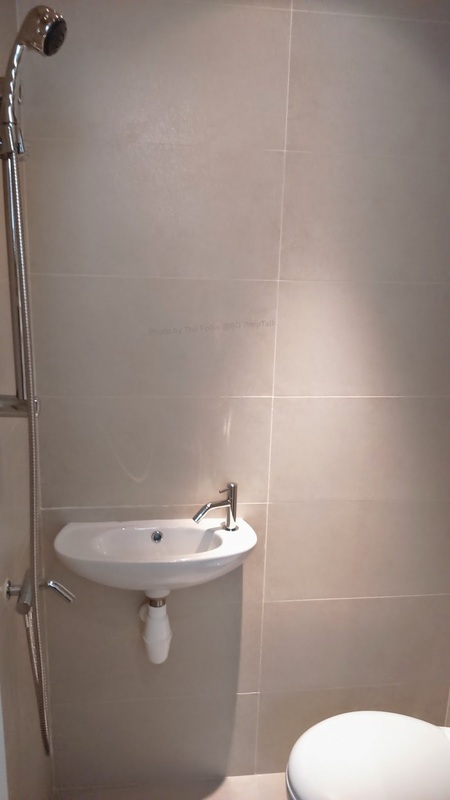 It is probably one of the smaller master bath that we have seen so far but we reckon something has to give somewhere. And we much rather the space be sacrificed in the bathroom! You do get an overhead "rain shower" here rather than the standard shower found in the common bathroom. And last but not least - the Study. 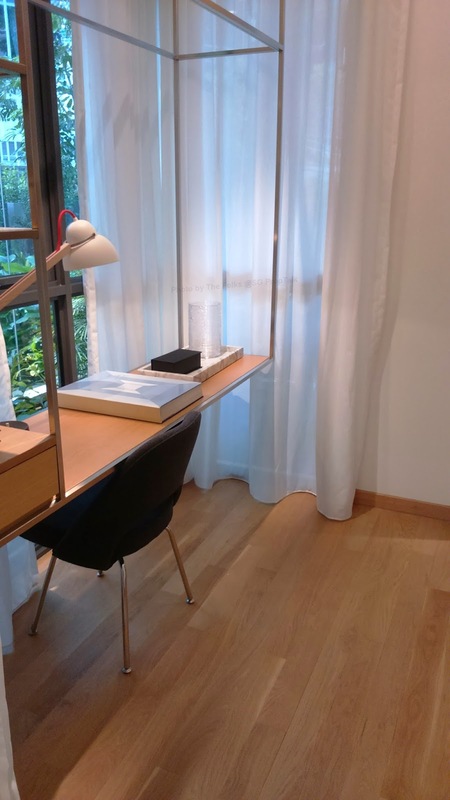 This area is linked to both the master bedroom and the main balcony, which means you can access the Study either by the door from the balcony or from within the master bedroom. It is a decent looking space that will fit 2 people doing their studies or work together more than adequately. Pricing wise, a Type B4 unit on the fourth floor of stack 42 costs $2,108,000. This translates to $1,660psf. The wife and I were told that the project has already sold about 2/3 of the total units. And for those looking at the 3-bedder + Study configuration, only 4 such units are still available (as of late last week). And with the 4-bedroom apartments, only 1 such unit is left. 1. 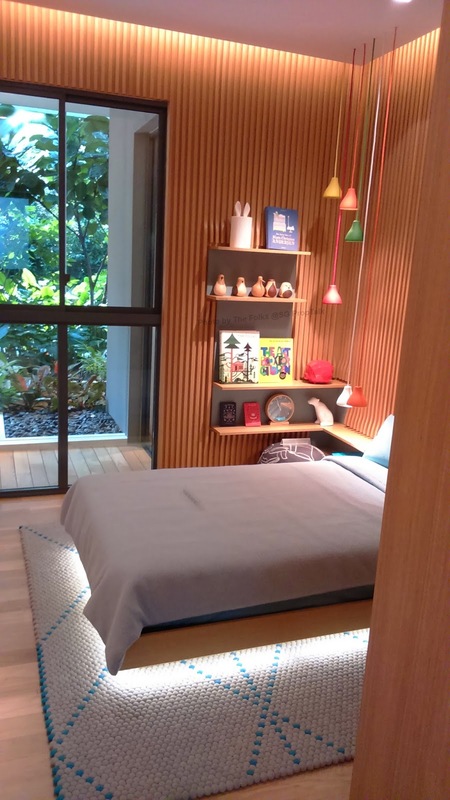 The space within the 3-bedder + Study showflat is very well optimized. 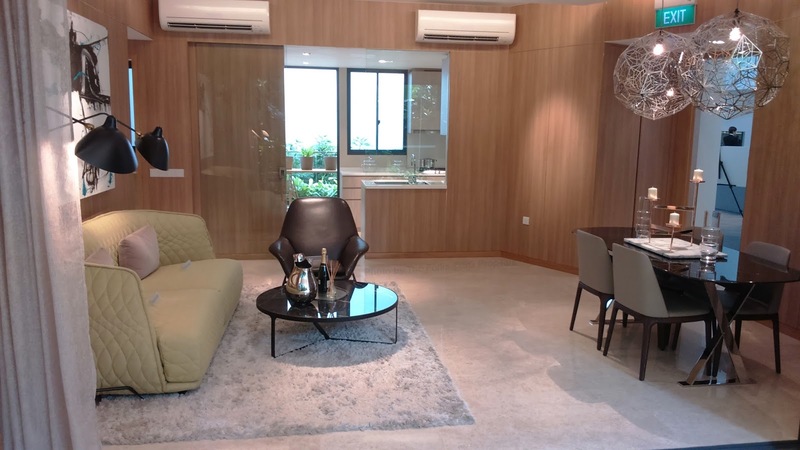 This makes the unit looked distinctively larger than the 1,270sqft that it is supposed to be... not forgetting that it houses two balconies too! 2. 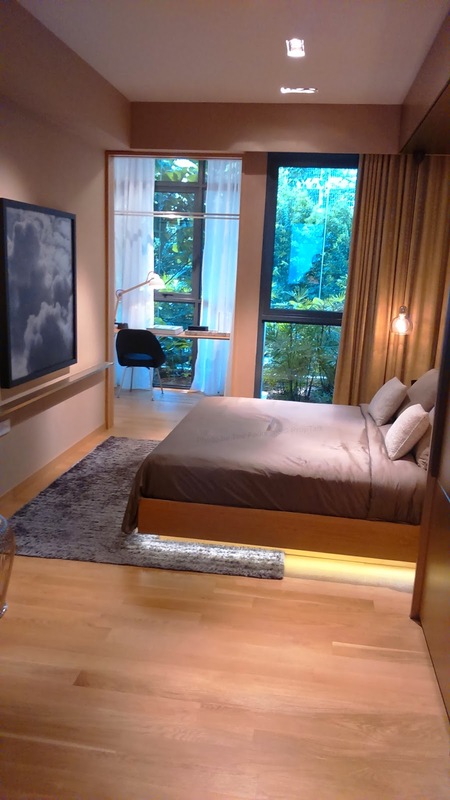 The spacious bedrooms, which is a breath of fresh air compared to those tiny ones (especially with common bedroom) that we typically find in new projects these days. 3. 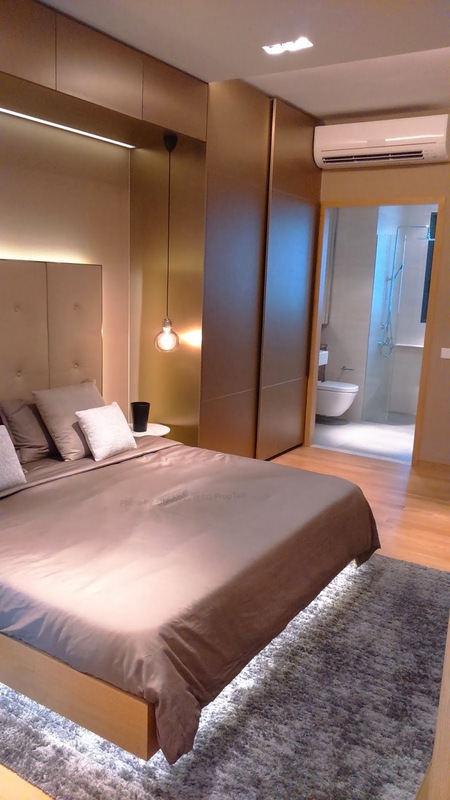 The quality fittings and furnishings within the unit, which increases the "luxury factor" of the apartment. 4. The absence of one-bedder units in 70 Saint Patrick's, which reduces the amount of units in the project thus increasing its "exclusivity" quotient. 5. For those with primary school going kids starting from 2017 or after, the good news is that there are a couple of options available within 1-km of 70 Saint Patrick's - CHIJ Katong (all-gals), Tao Nan (co-ed) and Ngee Ann Primary (co-ed). 1. 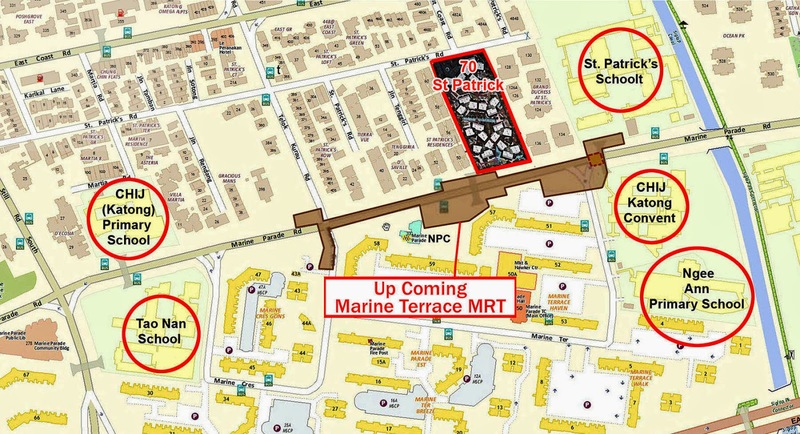 70 Saint Patrick's is TECHINCALLY across the road from upcoming Marine Terrace MRT station on the Thomson-East Coast line scheduled for completion in 2023. We say "technically" because the station is located at the back of the project and at this point in time, there is no firm indication whether a side-gate will be built for residents to access the MRT station. Failing which, they will have to walk the full length of the external perimeter of their estate to get to the station. This will probably be a good 10 - 15 minutes walk and subjected to the weather elements. 2. Maybe it's just us but nothing in terms of the facilities offered by 70 Saint Patrick's made us go "wow". All the bells and whistles are mostly there but it does come across as rather plain vanilla. 3. The way the blocks are sited means that quite a number of units between adjacent blocks are relatively close to each other. So unless you really enjoy very close proximity with your neighbors in the opposite block, you may have to invest quite a bit on curtains/blinds for privacy. Facilities and proximate neighbours aside, the wife and I are pretty happy with what we saw at 70 Saint Patrick's. 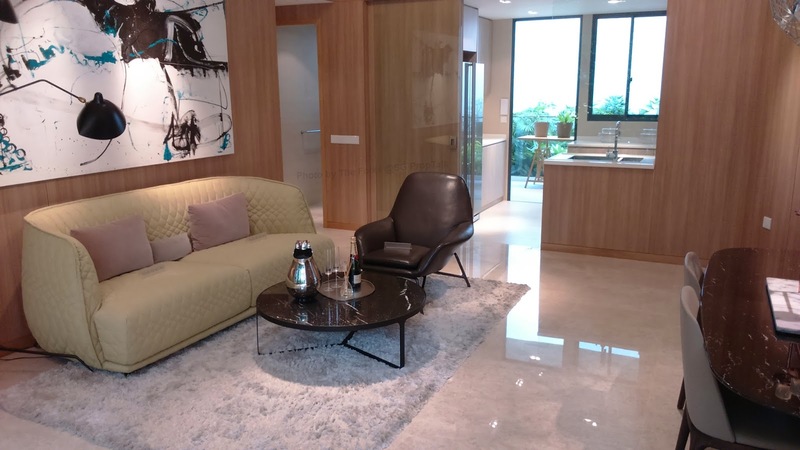 The apartment layout makes a lot of sense and the quality of furnishing and fittings as seen in the showflat is rather impressive. And the $1,600+psf price tag is definitely attractive given that 70 Saint Patrick's is a freehold development. It is no wonder that this project has been selling so well. No Comment to " 70 Saint Patrick's (Review) "